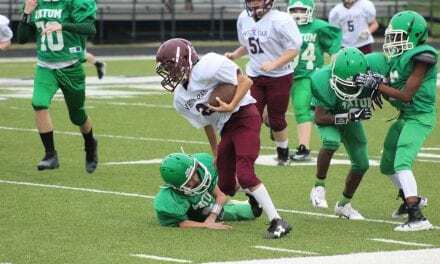 The seventh grade White Oak Roughnecks stomped the New Diana Eagles with a 30-0 win Thursday evening. The Roughnecks are officially 1-0. Will Young contributed three touchdowns with two 2-point conversions, and Dee Williams rushed for one touchdown and added a two point conversion to lead the offense in scoring. Young also rushed for 40 yards, had seven catches for 105 yards. Williams rushed for 125 yards. Gavin Sipes had 45 yards rushing with three catches for 35 yards. Shaw Stevens added two catches for 60 yards. Offensive line standouts were Reyson Gajewski, Brock Reddic, Cade Sullivan, Ryan Owens, Hunter Smith, Kash Ybarbo, and Davis Toliver. Defensively for the ‘Necks, standouts included, Brock Reddic for three tackles behind the line of scrimmage. Reyson Gajewski added another tackle for a loss. Dee Williams, Will Young, and Shawn Stevens each had an interception. The ‘Necks will travel to Spring Hill next Thursday to take on the Panthers at 5:00 pm.